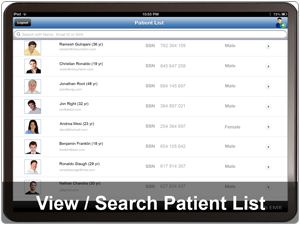 Say goodbye to paper charts, scanners and filing cabinets forever with the free In Touch EMR patient intake app designed for iPad. Practices using In Touch EMR can simplify the before, during and after practice workflow within minutes of downloading this intuitive app. This app enables patients to complete self-intake and upload documents to their online medical chart. Staff members can check eligibility and market to patients within seconds. When patients walk in, the front desk staff hands them an iPad for self-intake. Intuitive screens enable patients of all ages to enter information and complete intake. 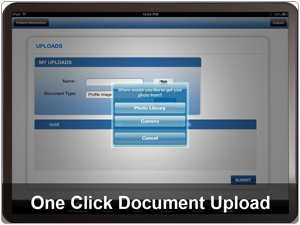 The integrated use of the built-in iPad camera in the new iPad allows patients to take profile photos and upload documents (medical reports, referral scripts) to their In Touch EMR online medical record with the click of a button. 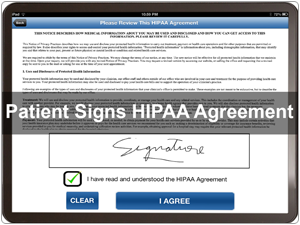 Patient signs a HIPAA agreement to complete intake process and hands iPad back to the staff. 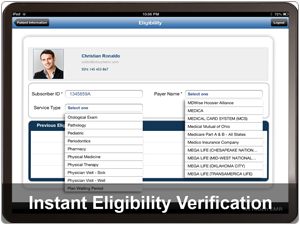 The front desk person uses the integrated eligibility verification function to test eligibility with several different service type options. In many cases, this can help avoid the need for a phone call to the insurance company, saving time and boosting practice efficiency. A list of previous eligibility requests for the patient can also be reviewed. The front desk can add / edit communication preferences (email, Phone, SMS) for the patient. Phone, SMS appointment reminders and emailed newsletters improve patient compliance and reduce appointment cancellations. Industry-standard security ensures safety of all patient information. Once the patient intake begins, the app prevents the user from returning to the patient list unless the app is ‘unlocked’ with a password. All patient data is protected and belongs to the user. 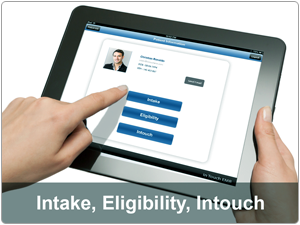 The In Touch EMR iPad app is a companion to the In Touch EMR application which can be used on any browser of your choice on a PC or Mac.